Location. 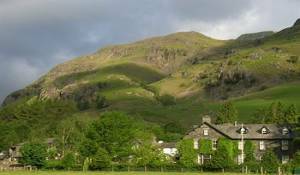 Located in Ambleside (Lake District) New Dungeon Ghyll Hotel is close to Harrison Stickle Pike of Stickle and Easdale Tarn. Also nearby are Helm Crag and Grasmere Garden Village. Hotel Features. Dining options at this Ambleside hotel include a restaurant a coffee shop/caf� and a bar/lounge. A complimentary breakfast is served each morning. Additional amenities include tour/ticket assistance laundry facilities and a garden. Guest parking is complimentary and available on a limited first-come first-served basis. This is a smoke-free property. Guestrooms. Rooms open to patios. The 20 guestrooms at New Dungeon Ghyll Hotel include coffee/tea makers and hair dryers. Televisions are equipped with digital channels. All accommodations provide desks and phones. In addition housekeeping is offered daily and amenities available on request include irons/ironing boards. Looking for a budget hotel ?